Dolphin Press & Print is a professional printmaking and letterpress shop housed in the Printmaking Department at the Maryland Institute College of Art (MICA). Established in 1998 by Hilary Lorenz and John Yau, the Press was designed to promote collaboration between visual artists, writers and students in order to produce limited-edition letterpress books and broadsides. Throughout its history, the Press has produced more than 40 such projects in addition to in-house posters and announcements. In 2000, master printer and papermaker Gail Deery, Chair of Printmaking at MICA, assumed direction of the Press. She broadened the mission statement to include printed editions in a variety of printmaking media. In 2003, Whitney Sherman, Chair of Illustration at MICA, expanded the scope of Press projects to include work with illustration book artists/designers as well as students from the Illustration Department. Deery and Sherman serve as Co-Directors of the Press. 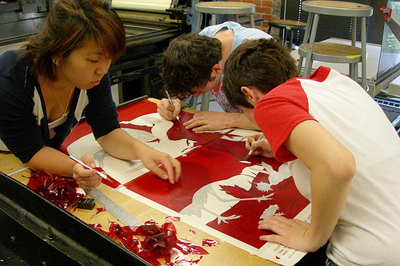 Dolphin Press & Print is closely tied to the MICA Printmaking Department curriculum. The Press offers students the opportunity to work in collaboration with established artists, writers and printers. Each year, an undergraduate student is appointed staff printer; the student takes an active role alongside the faculty coordinator in leading projects, maintaining the shop and archives, assisting classes and workshops, and representing the Press to other institutions. Past projects have included editions with Jon Rappleye, Jane Kent, Christopher Whittey, Willie Birch, Grace Hartigan, Lesley Dill, John Yau, Linda Bills, Renee Stout, Henrik Drescher, Wu Wing Yee, Jeremy Seigler, Dae Sang Eom, Marcella Durand, Anne Waldman, Anselm Berrigan, and Justin Sirois.